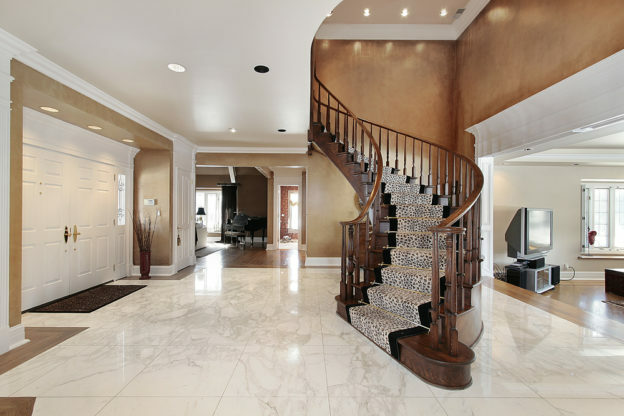 Are You Looking For Some Different Foyer Flooring Ideas? Are You Looking For Some Foyer Flooring Ideas? Okay. So, you’ve got a beautiful home. You’ve figured out what you want to do with every room of your house. The kitchen is all set. The bathrooms are good. The bedrooms are taken care of. Living room? Check. But, you’ve kind of overlooked a particular area in your house. It’s not exactly a room or anything. In fact, it’s kind of like a hallway. But everyone sees that space as soon as they walk through the front door. So, you want it to look nice. But, you’re not sure how to do that. This probably means that you’re currently in the market for some foyer flooring ideas. Anything helps, right? Well, we’ve got you covered. Check this out. It’s just a hallway, right? Why does the flooring matter so much? Well, the answer is pretty simple. The foyer is the entrance to your home. Again, it’s one of the first places people see upon walking into your house. And, as they say, first impressions are lasting impressions. The entrance to your home should speak about the personalities of the home and the people who live in it. It should be an addition or extension of the rest of your home. So, when you’re thinking about foyer flooring ideas, it’s best to remember that the whole space should compliment your home. How about we dive right into some great foyer flooring ideas? These suggestions are sure to get you started on the road to creating the perfect look for your home’s entryway. Tile, tile, tile. Everyone knows what tile looks like. Most people have tile flooring in at least one part of their home. But, how about putting it right there, smack dab in the middle of the foyer? Tile can add a practical yet beautiful touch to your home. Tile comes in so many different sizes and colors. So, it’s versatile; you can certainly find some tiles that add to the look and feel of the other areas of your house. Tile does have the tendency to show signs of wear after a while. So just keep that in mind when choosing the color of your tile flooring. Knock on wood! Looking for sophisticated foyer flooring ideas? Ding, ding! We have a winner! Hardwood flooring is absolutely beautiful and can give your home whatever look you’re going for. It can be classy and modern. It can warm and welcoming. It’s easy to keep clean and it’s pretty durable. So, you don’t have to worry about the constant foot traffic making it hard to keep neat. Hardwood is definitely a great choice for your entryway. Laminate floors. They can imitate the look of tile or stone. They’re durable and fairly easy to maintain. Laminate floors are versatile and allow you to pick exactly what you need in order to make your foyer a force to be reckoned with. Last but not least, stone. When you’re looking for foyer flooring ideas, stone is a great option. They definitely give a high-end look to your home. It’s not hard to clean these floors, either. Stone flooring comes in several different colors and styles. Now that you have some great foyer flooring ideas in mind, you’re probably ready to get to work. But, the first thing you need to do is get rid of your current floors. That, friends, is where Dust Busters Floor Removal comes into play. We can help you to get that old flooring out of your home. We work quickly, making it easier for you to move on to the next part of your exciting flooring project. Ready to call in the pros? Contact us today!